Sydney Campanella and Lauren-Kate Stewart, both 13 years old, are best friends who enjoy reading, playing the piano, and horseback riding. The young teens are also published authors! Their chapter books are intended for readers aged 7-12, or the stories are fun to read aloud to younger children. Sydney has published three books: The Mysterious Birthday Gift , Mystery on the Trail , and Mystery at Camp Lakeside . The first takes place in a house, the second is on the Appalachian Trail, and the third is set at summer camp. Sydney’s books are exciting and wholesome family mysteries that chronicle the adventures of siblings Matt and Teresa and their golden retriever, Rusty, based on her own dog Sunny. Lauren-Kate has published two books: Commander You You and the Imperial Diamond and Commander You You and the Time Penny . Lauren-Kate’s books are imaginative stories about kids who live in space and have out-of-this world adventures with lots of funny and strange characters. Her pet cat, Fluffy, was the inspiration for the cat in her stories. Lauren-Kate is also working on a third book in her series and hopes to have it completed soon. 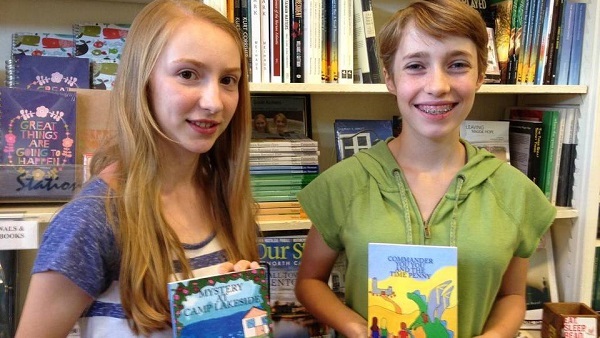 The books written by these two girls were the result of a weekly homeschool writing course that they started taking when they were in 4th grade. Sydney’s mom, Ann Campanella – an editor, poet, and published author herself – taught the class using the curriculum Learn to Write the Novel Way . Every week the students would bring their writings to class and read their work aloud, discuss ideas, and give each other feedback. Besides writing, Sydney’s favorite subject is science. She enjoys playing basketball, volunteering at her church, and exploring the woods and creeks around the small horse farm where she lives. Lauren-Kate’s favorite subjects are history and mythology. When she’s not busy doing schoolwork she enjoys fencing, rock climbing, and traipsing through the woods with her friends. Sydney has a series of blog posts about the writing process on her website. She hopes that these tips will be helpful for other kids who are learning to write. Lauren-Kate also has some advice for young authors: “I learned with my first book that writing ‘The End’ is just the beginning of finishing a book. I now know that editing is one of the most important parts of writing a book.” She actually spent more time editing her books than it took to write them. Sydney and Lauren-Kate each created the cover art for their books with help from their art teacher, Joanna Rissanen. Sydney’s mom assisted with the publishing, and Lauren-Kate’s mom guided the marketing. The books are available at Main Street Books in Davidson, North Carolina; or you can order signed copies from the girls’ websites: laurenkatestewart.com and sydneycampanella.com; or click the book covers below to buy them online at Amazon.com.